Sometimes simple is best. We are a PROFESSIONAL PRESSURE WASHING franchise. This type of focus allows our franchisees to best serve their customers because they are trained to do one thing – and that’s to pressure wash any surface that comes their way. 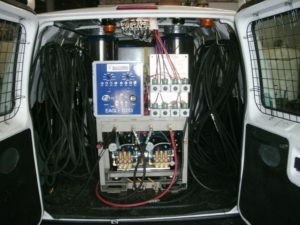 Sparkle Wash designed, patented and manufactured the industry’s first completely self contained MOBILE PRESSURE WASHING system. Sparkle Wash continually invests in RESEARCH and DEVELOPMENT to stay at the top of the industry. Sparkle Wash has also developed specialized environmentally safe products and applications technologies. We work with you to determine what you need to succeed, so you only buy what will make your business profitable. 99% of our parts are made in the USA. And all the equipment is assembled in Oakwood Village, OH. When you purchase Sparkle Wash Franchise you can be assured the equipment package includes everything you will need to clean a multitude of surfaces in the Commercial, Residential, Fleet, Construction and Industrial markets. You might be wondering if there is really enough pressure washing work to develop a profitable and successful company? To help answer this question we ask that the next time you drive to your local grocery store for instance, take a look at all the possible customers and pressure washing opportunities within a 5-10 mile radius. There is the gas station on the corner (storefront, parking lot, pump area, awnings and sign), the local high school (buses, school building, sidewalks, stadium bleachers), the grocery store (loading docks, storefront, sidewalks, signage) not to mention all the residential homes you passed along the way! Our equipment and training will provide you the knowledge to tackle any type of dirt and grime on any type of surface. The need for our service has endless possibilities. The Sparkle Wash marketing team will assist you with LOCAL MARKETING PROGRAMS designed to target all the pressure washing opportunities in your territory and BUILD BRAND AWARENESS. We blend traditional media like local advertising with a strategic online strategy including SEO, AdWords, Inbound Marketing and more. This proven two-prong approach will get your phone to ring. Instead of offering customers lower margin services like window cleaning or landscaping , we stay focused on our core offering – pressure washing. Based on research and experience, the pressure washing market continues to lack professional competition verses other service based industries. The difference with our pressure washing opportunity is that our heavy-duty pressure washing equipment allows our franchisees to perform work across multiple markets, surfaces and dirt types. So when you think about owning a Sparkle Wash franchise don’t just think about washing houses, in fact higher margins and revenue comes from our multi-market power washing segments. “Having been in the business now for several years, I can proudly say we blow the competition away. At least once a week customers are amazed at how nice our equipment is. They are always impressed that we have everything we could possibly need housed in one work van and not a trailer or a huge box truck. Customers have told me they are always fearful of the “other guys” as they could destroy their yards, take out tree branches, bump into other things with their bulky equipment, and they just flat out do not look professional at all in their pick-up truck and/or trailer. 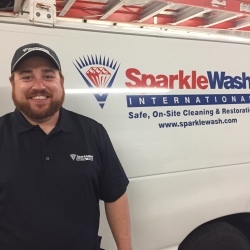 Get in-depth information on owning a Sparkle Wash franchise with this free guide! We are available to assist you 8:00 am – 5:00 pm EST.